Diese App nimmt nachts Deine Geräusche, die Du von Dir gibst wehrend Du schläfst auf und sie ist mit Voice Over bedienbar. Die Aufnahmen kannst Du mit anderen Nutzern teilen, wenn Du möchtest. Oder stöbere einfach in den Aufnahmen anderer Nutzer. "Getting this app showed me that what I thought was occasional snoring was actually Severe sleep apnea. I was waking myself between 60-100 times a night, with loud snoring that sounded like something from a space alien…If I could give it 100 stars, I would." Afraid of revealing secrets? Afraid of missing brilliant Da Vinci ideas you dream about? Or are you just looking for rock solid evidence that your partner snores? 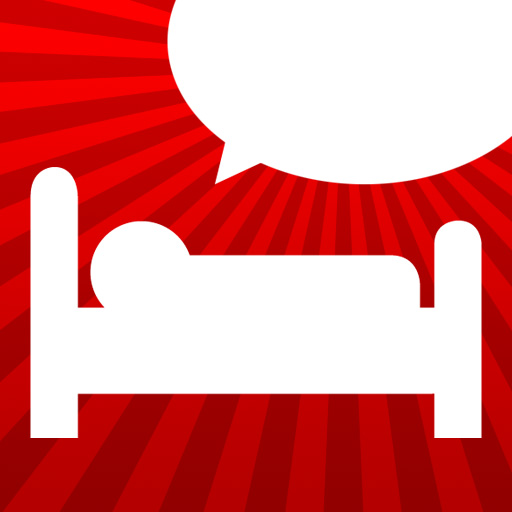 In Sleep Talk Recorder you get it all. A sleek interface with individual settings for sensitivity and filtering. A history that saves your recordings and sorts them on a timeline, night by night, for easy navigation. You can also add your funniest clips to your favorites and share them with your friends or the world for great laughs! Leider ist diese App unter Android nicht funktionsfähig. Es kann sein, dass sie sich bedienen lässt, wenn man mit sehender Hilfe die Buttons beschriftet. Aber im Auslieferungszustand ist die App mit Talkback nicht bedienbar. Getestet unter Android 4.4 mit dem Samsung Galaxy Young 2.